I had a bunch of left over veggies in my fridge. None were enough for a meal, so I decided to make egg muffins with them! Sometimes I feel I get stuck in a breakfast rut. I tend to stick to the same foods for a few months and then eventually become sick of them. My go-to’s have been kashi cereal and english muffins with peanut butter. When I’m lucky, my husband will wake up early and make me an egg sandwich….awww what a guy! 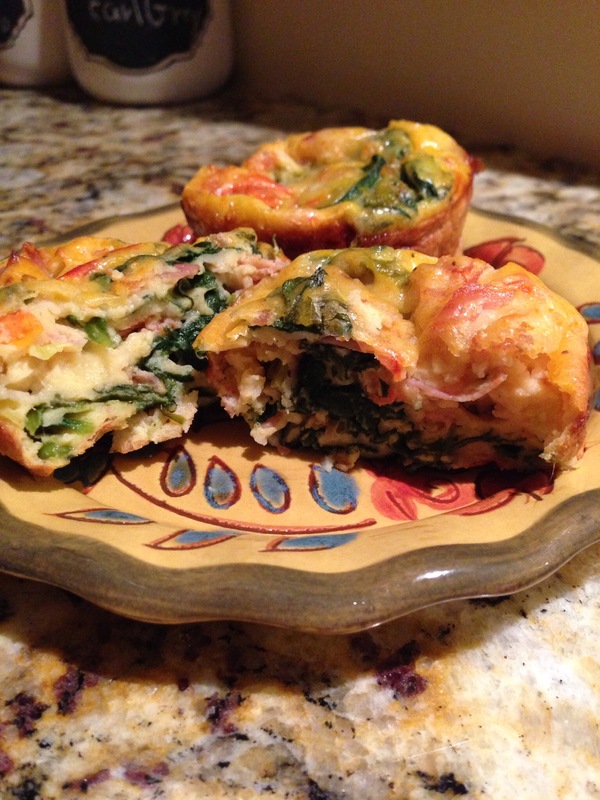 Recently, I’ve started eating more oatmeal and now I’ll have to make these egg muffins again and again! What I love about them is: 1. TASTED GREAT!! 2. Are so easy to prepare in advance and reheat in the morning 3. They make a great snack 4. You can add any type of vegetable you have in the fridge! This recipe was inspired by the egg muffin recipe from skinneytaste found here. I used zucchini, cherry tomatoes, scallions, and spinach, and I got to use my spiralizer for the first time!! Bake at 350 for28-30 mins. Enjoy! Preheat oven to 350 degrees and spray muffin pan with olive oil spray. Heat the oil in a large skillet over medium heat. Saute garlic for 1 minute. Add scallions, tomatoes, zucchini, and ham and cook another 5-7 minutes. Add spinach and cook until wilted. Set aside. In large bowl, whisk the eggs, milk, flour, salt and pepper until smooth. Add the cheese and cooked veggie mixture to the bowl. Pour into prepared muffin pan and bake for 28-30 mintues. What a great way to use eggs! Looks delicious, too! And a great way to use the leftover veggies that otherwise would have gone bad! Mmmm fresh eggs would make these taste even better! They look fabulous!!! Have you tried to freeze them? Laura- No. But that’s a great job!